As I’m typing this, I can see some actual brown and crispy leaves outside. I KNOW. Following on from this earlier post where I talk about autumn makeup, I am also obsessing over Autumn skincare. It’s time to add even more oil and to really up the skincare ante. It’s time to switch to balm cleansers. Just kidding, I always use balm cleansers. I’m trying a few new ones at the moment – will do a post soon – but basically something really rich and oily is needed to combat any dry skin. There’s always the good old Emma Hardie balm – also love Oskia Renaissance and REN. Then afterwards, a really hydrating toner. I love the Trilogy one because it feels so light on the skin but actually does make a difference in terms of hydration. Then, oils. Oils everywhere. Caudalie is such a good option for oils that really hydrate the skin – I like to use one at night and really spend a good five minutes massaging it into the skin and then leaving it to soak in properly. Then a good serum layered under a moisturiser – lots of layers are always better than one massive bit of moisturiser. 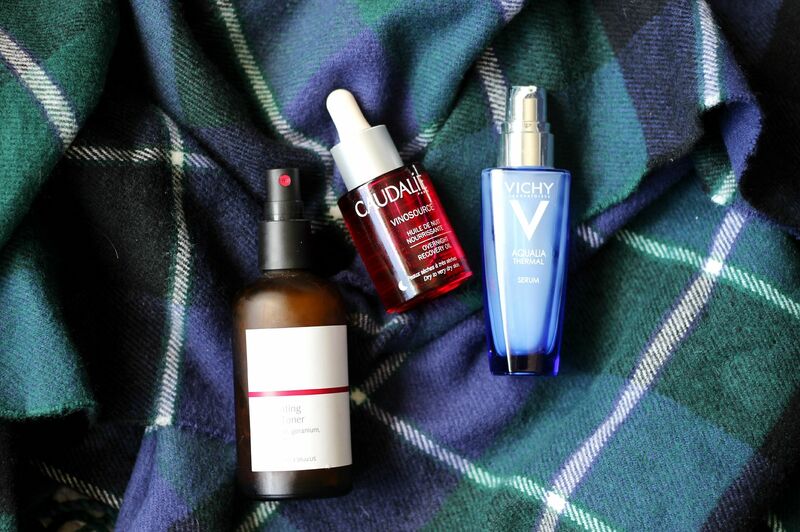 The Vichy Aqualia thermal serum is one of the best for battling dehydrated.